I came to Gili Trawangan to do my open water course when I first started backpacking. Before my first dive we learned skills in the pool and learned the basic theory about diving. Prior to every dive the instructors and divemasters will do a dive briefing where they go through all the details for the dive. I loved that the environment is part of every briefing. As we get to dive in the ocean and visit the home of all the amazing marine life it made me happy that part of the education to become a certified diver is the environmental awareness and how to be respectful to the underwater environment. Divers are reminded that we shouldn’t touch any marine life or try to take a piece of coral or anything else as a souvenir. Take only photos, leave only bubbles right! Especially in the beginning while we are still learning and working on our buoyancy we are reminded that even one single fin kick could destroy a piece of coral that took years and years to grow. So in the beginning we always try to keep a certain distance until we’re used to all our equipment and feel comfortable while scuba diving so we can get a closer look at things. There is another way of looking at it. 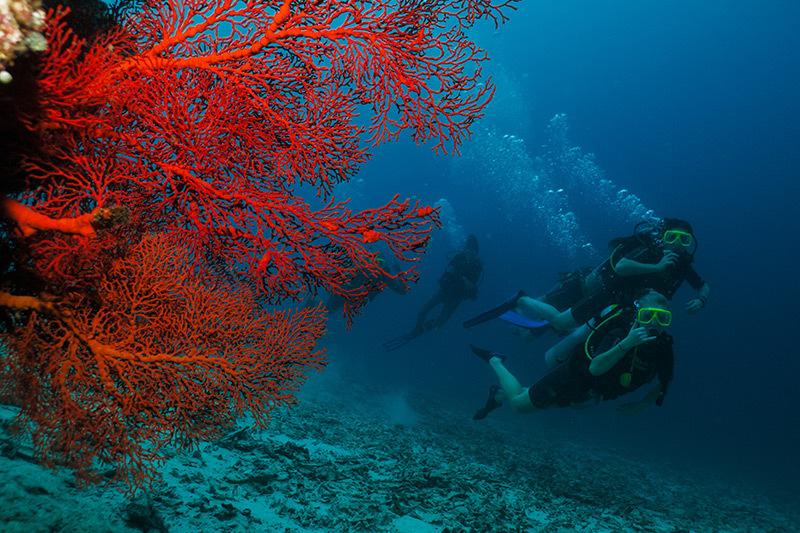 Good buoyancy control and no touch policy are not only for keeping the reefs undamaged and in a good condition. We shouldn’t make any contact to the marine life or reef because it can be dangerous and harmful to our own health. There are numerous species of fish that are both poisonous and perfectly camouflaged. These fishes include scorpionfish or stonefish in the waters around Gili Islands. Any contact with one of these would be not only very painful but also potentially dangerous. After my open water course I was already in love with diving because it gave me the opportunity to explore the oceans. As an animal lover I am always excited to meet animals in their natural environment. I call it underwater magic because it’s a getaway from the hectic life above the surface. When I’m breathing under water it’s a completely different world of peace and calm. This is why I kept diving and did more courses which eventually led me to change my life from backpacking around the world to wanting to become a dive professional. I signed up for my Divemaster course at Gili Divers where I did all my other courses,too. The reason is chose the was that I am fully satisfied with the quality of the training and the employees made me feel welcome from the first day I was diving with them. I have been a Divemaster trainee for a couple weeks now and I’m loving every part of it. We are aware of the problems all over the world for example, coral bleaching, plastic pollution and overfishing so we try to do our best to help sustain our oceans health. But that is not always so easy or simple. As a Divemaster trainee I get the opportunity to participate in a weekly reef clean up organized by Gili Divers. On mondays all us divemaster trainees go for a dive with a few Divemasters and pick up all the rubbish we can find and collect it in mesh bags. Sometimes the things we find are pretty random and obviously dont belong in the sea. We’ve found loads of plastic, beer bottles and things like nappies or broken flip flops. Even on a normal training dive or fundive I will always pick up a plastic bag or a bottle if I see one. I have already noticed other divers observing me when doing so. Sometimes these divers will grab a plastic themselves and put it in their BCD pockets so we can then throw them away when we’re back on the boat. I think it’s very important to be encouraged to take care of the ocean life by setting an example and doing something, even the smallest thing, to help to reduce the problem. Every friday evening we join a beach clean up organized by Gili Eco Trust where volunteers meet up at the beach and pick up all the trash and cigarette butts we find on different beaches on Gili T. All the garbage and litter gets separated for recycling when getting picked up. After about an hour of cleaning the beaches all the volunteers can socialize over a free drink we get for participating. Gili Eco Trust encourages people to reduce their plastic waste by educating people to refuse single use plastics like straws or plastic bags. They sell reusable water bottles and show places on the island where we can refill our water bottles. Gili Divers and the two sister hostels Gili Mansion and Gili Castle are a few examples where there is a water refill station. Gili Eco Trust also takes care of the cats and horses on the island and they have an artificial reef, bio rocks, project. This is one of the biggest human created coral reefs in the world. At our dive shop we encourage divers to pay a small one time donation to Gili Eco Trust as a reef tax to support all their work for Gili Trawangan. I’m loving the life as a diver and trying to keep the nature intact so everyone can enjoy it.